Whether you are launching into a new build or upgrading the look of your home, choosing an attractive, high performing front door is a critical decision. And it’s also a fun, creative, and exciting one! 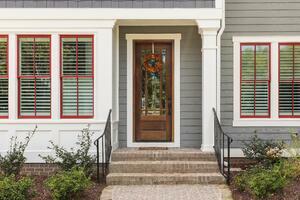 Your entry door is one of the first elements people notice when they walk up to your house. It welcomes them into your home and speaks volumes. Learning about various door styles ensures you’ll love what it has to say! If you have a standard sized entryway, then the possibilities are endless! You can choose from wood, wood clad, fiberglass, and steel with the options for glass inserts, sidelights, and transoms. Premier manufacturers offer a range of choices, from natural grain to eclectic color palettes. While “traditional” implies a classic style, you can also choose more modern and contemporary doors to complement both your exterior and interior decor. The door is literally wide open in terms of finding the right style and fit for your home. If you have a larger opening or grand entryway, you need a door that will make a statement. Better yet, why not have two doors? Double doors feature two vertical panels that meet in the middle when closed. You can opt to have one door fixed or to have both doors fully operational. Double doors can be crafted from the same materials as standard doors, including wood, clad wood, steel, and fiberglass. They can also feature glass inserts and other decorative touches. 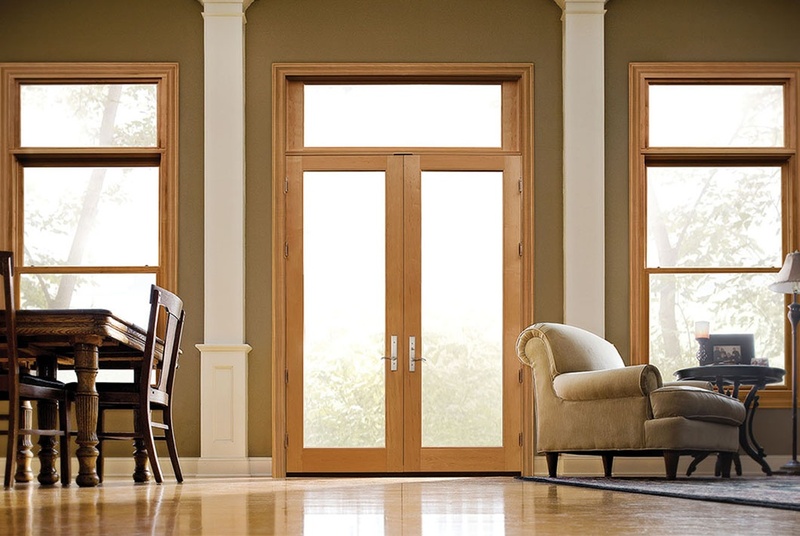 Among the most popular double door styles is French Doors. Elegant and refined, they enable you to take maximum advantage of natural light and transform even simple rooms into stunning showpieces. Usually a pair of panels (or sometimes more), they feature glass panes that extend for most of the length. To boost security and stability, you can opt to have fiberglass or steel as the supporting material. Their versatility allows you to customize your entryways: they can open inwards or out and from left or right. As mentioned, one door can be operational while the other(s) is decorative. We typically see these used for patio areas, an excellent way to let nature in while still enjoying optimal comfort and privacy! From ultra-modern to an ageless classic, a Craftsman door delivers a traditional feel straight from the Arts and Crafts Movement (1880-1920). They work best with Craftsman or Craftsman-inspired architecture, which allow their simple, natural charm to shine through fully. These doors are crafted from hardwood, particularly oak, cherry, and mahogany, and may be stained or painted. Today, though, you have the option of selecting reproductions made from composite wood or steel for greater durability and protection from the elements. Craftsman doors usually have glass panes in the top third portion of the door: they can be one pane or small ones separated by wood trim. You can also choose models with sidelights and/or a transom. This adds another simple, yet elegant, touch to these sturdy stalwarts. Looking for farm-fresh flavor? Modern farmhouse exterior doors offer more than a heaping portion of wholesome, hearty style and quality. Options vary from rustic double doors with iron strap hinges, tall escutcheons backing the doorknobs, and a barn-like aesthetic to more simple panels with large panes of glass separated by slim but solid wood mullions. These doors offer an excellent way to bring a breath of fresh air to your home. Want to make a bold statement? 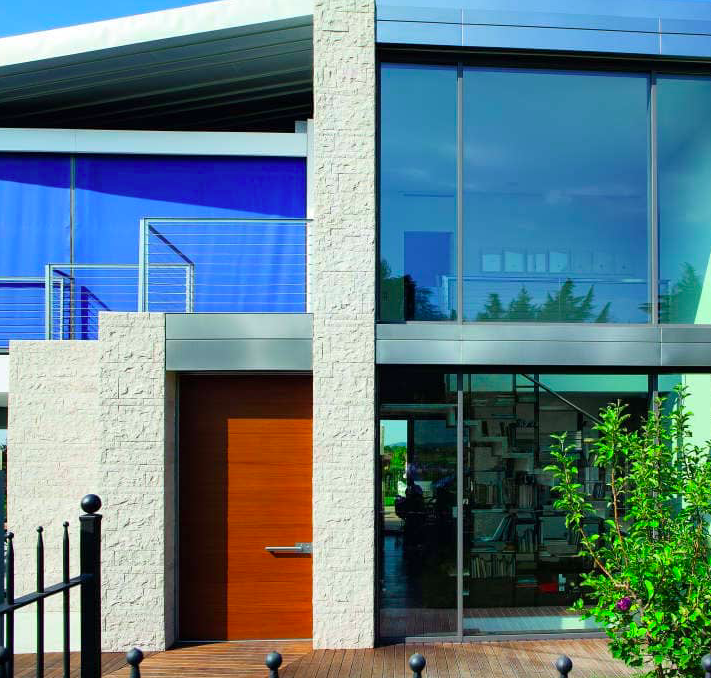 Pivot doors offer an unconventional, contemporary - and simply gorgeous - solution. These doors rotate on a pivot box (floor) and jam (top) rather than on side hinges as is typical. Not only does this introduce a sleek aesthetic, pivot models are ideal for large entryways (e.g. 9’ x 13’). They feature high-performance hardware for seamless operation even in wider and taller door ways. You can even opt for double pivots for door panels that seem almost independent of the frame. Pivot doors are certainly one of the highest end solutions: they may cost up to twice as much as a standard single door. However, there is no denying the luxury and “wow” factor they add to your modern home. Standard exterior doors are 30, 32, or 36 inches wide with a height of 80 inches. 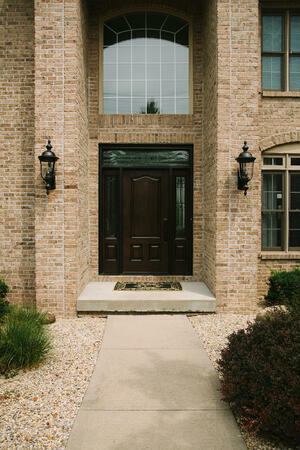 Depending, however, on the size of your home and entryway, a larger door is necessary to complete the aesthetic. A standard door may feel more like the entry to a hobbit hole! Oversized doors present some challenges: there is a greater chance of warping and malfunctioning due to the size. Fortunately, though, today’s top manufacturers create durable and long-lasting solutions with your choice of fiberglass, steel, aluminum, glass, and even wood. As mentioned, pivot doors are excellent for non-standard sized entryways, but you can also opt for a more traditional look with oversized single or double-panel models (and multiple-pane options for glass doors). As you’d expect, the cost for oversized doors is higher simply because of their size. The addition of “extras” like glass inserts, sidelights, and transoms will also increase the price. You will need to custom order a door that is the best fit for your home. We can help make that process as seamless as possible so you can enjoy the experience, as well as the functionality and beauty for years to come. Excited to find the right exterior doors to complete your home’s style and add to its functionality? If you are looking for clear education on all of your entry door options and peace of mind that the job is done right, contact us at Franklin Window & Door for a free in-home design consultation.